Hello and welcome to AEDE’s DANCE BIRTHDAY PARTIES! Due to our busy class schedule we typically have birthday parties on Sundays. There are some exceptions to that where Saturday’s and other days of the week may be available so please feel free to ask about your preferred date and we will let you know if we can accommodate it. Here are the details regarding the Birthday Party. The party is 90 minutes long, taking place in two different studio’s. The first 45-60 minutes The Teacher and her assistant, will take the children through a variety of dancing, stretching, games etc. 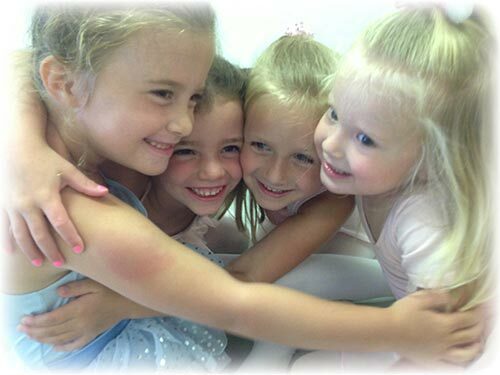 $160.00 for 90 minute party for up to 10 children. Each additional child beyond 10 is $18.00 per child. Only 25 children maximum per party allowed. Please ask if you have more than 25. The Birthday child is free. Please arrive with the Birthday Child 15 minutes early to set up the party area. No parents allowed in the dance studio except for the guest of honor, the birthday child’s parents. Please be sure your parents and children’s shoes are free of any dirt, water, or the like before entering the dance studios. Absolutely no food or drink is permitted inside of the dance studio except during the last 30 minutes of the party. All food, refreshments, are supplied by the party giver including paper plates, cups, napkins etc., candles, decorations, goodie-bags, and the like. The Teacher and her assistant will teach the dance portion of the party and will be available the last 30 minutes to help with the party in the 2nd studio. We ask that you are all picked up and cleaned up at the end of the party within the time allotted. Most of all enjoy this special day and event. Happy Birthday from all of us at AEDE!